I have been craving bead embroidery quite a bit lately. Perhaps it was remembering my earlier Egyptian beadwork, or just longing for something a bit different. Either way, I am looking forward to getting back into it sometime in the near future, though I may have to make it a 2012 resolution. I’m working on finding just the right foundation material. Genuine leather and suede are expensive and difficult to work, ultra suede and acrylic felt are out, because of what they are made of. I’ll just have to keep looking. 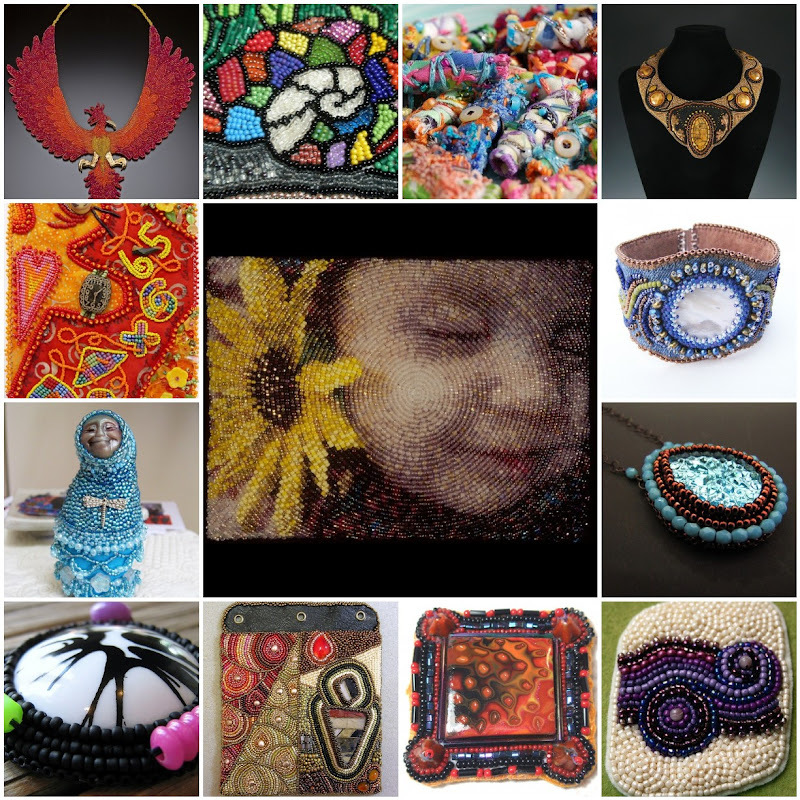 In the meantime, I wanted to indulge just a little bit, and I found some gorgeous bead embroidery designs on Flickr. The variety of design styles showcases the versatility of this technique. It’s one of the only beading styles that has no rules, just guidelines. There’s the classic rosette style, freeform, cabochons, and one of my favorites, embellishing patterned fabric. Which embroidery style do you like most? I love the photos! I'm hankering for some bead embroidery also. What's with the ultrasuede and acrylic felt? I'm still a newbie and don't know what you are referring to! Thanks Mandy! I'm trying to steer clear of synthetic fabrics and materials made from plastics. Since nylon threads are the best for beadwork, I choose to sacrifice the embroidery backings and some other materials I might want to use in beading. This is just a personal preference. Ultrasuede is the #1 backing choice for most beaders. I went to the flickr stream on a couple of these people and ended up losing an hour just drooling over beautiful things!! I wonder if you can use felt, a real wool felt for backing? If you knit, you could make your own swatches, too. I've been thinking that I might like to try bead embroidery but don't know where to start! Thanks for this. Wool felt is on the very top of my list of things to try - I just have to get around to picking some up! I'm very optimistic about it. I've used acrylic felt in the past for embroidery, and I really liked the results, so hopefully it will work.